Posing with the Senior Master Sgt. 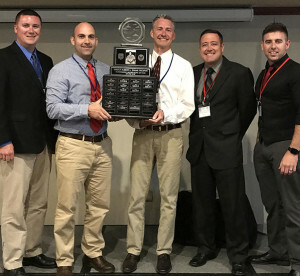 Albert L. Evans Award, from left to right: Master Sgt. Aaron Ray, 370th Flight Test Squadron; Master Sgt. Lindsay Moon, 418th Flight Test Squadron; Senior Master Sgt. Ernest Burns, 418th FLTS Detachment 1; Senior Master Sgt. Scott Scurlock, 370th FLTS; and Tech. Sgt. Adam Joachim, 418th FLTS. The Edwards AFB boom operators were presented with the award at the 38th Annual Boom Operator Symposium held May 12-13, 2017, at Altus Air Force Base, Okla.
Boom operators from Edwards Air Force Base, Calif., were recognized as the top air refueling section in the Air Force after being presented the Senior Master Sgt. Albert L. Evans Award at the 38th Annual Boom Operator Symposium held May 12-13 at Altus Air Force Base, Okla.
Refueling squadrons across all major commands and refueling platforms compete for the prestigious award, which is given annually to recognize the most outstanding boom operator section in the Air Force based on the accomplishments and professional qualities of the assigned boom operators. Aerial refueling operations at Edwards are a combined effort between boom operators from the 418th Flight Test Squadron and the 370th Flight Test Squadron. With 75 aircraft in 15 different airframes, along with a multitude of test sorties being flown each week, the dynamic mission at Edwards keeps them constantly busy, aerial refuelers say. 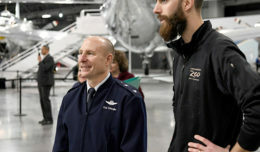 From taking part in testing of the new KC-46A Pegasus tanker, to completing aerial refueling certification of the fifth-generation F-35 Joint Strike Fighter, Edwards boom operators support top DOD acquisition programs along with the continual aircraft modernization programs the 412th Test Wing oversees. The boom operators also supported multiple legacy tanker upgrade tests including the KC-135 Block 45 program, which base leadership says provided a critical fix that enabled the full-rate production decision extending the life KC-135 fleet to 2040. “Boom operators from the 418th along with the 370th put a lot of expertise, hard work and man hours to the planning and execution of tanker developmental test and test support,” said Joachim. The Senior Master Sgt. Albert L. Evans Award was established in memory of Evans who is described as a pioneer in the history of Strategic Air Command’s air refueling operations. Online archives report Evans died along with four other KC-135 Stratotanker crewmembers during a crash at Castle Air Force Base, Calif., Sept. 19, 1979. 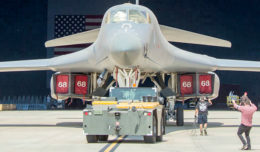 Being able to refuel military aircraft in the air is critical to the U.S. military’s ability to effectively operate globally, according to the Air Force.